Let me introduce you to Snow. No, I haven’t gone dark – tempted as I am, the prospect of having to wait several years for it to grow back out when I want to go back to red is really putting me off. Been there, done that, got the massive bleaching damage. But I do love black hair so, so much. When I was around 20 I dyed my hair dark brown, so dark it pretty much looked black. When I came home my Grandma took one look at me and said: “You look like a dying Snow White!” My reaction was along the lines of “OMG THANK YOU <3 !” Then I realised she hadn’t meant it as a compliment… She basically thought I looked terminally ill with my pale skin set against the raven hair. Well, I’ve always loved the look and I still think Snow White beats all the other princesses for style. 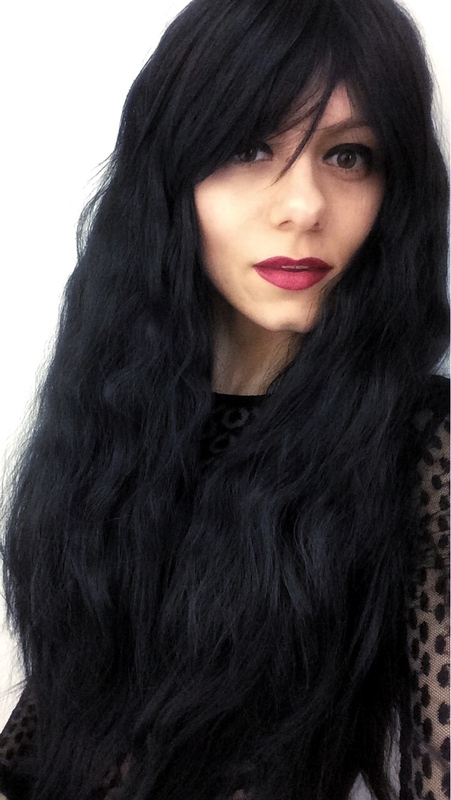 Among the many wigs I’ve fallen in love with is the raven-black, wavy, thick-fringed one from the picture above. Apparently – at least on the photo – it looks so real that people started messaging me to comment on the new hair. And somehow it’s more than a wig. When I first put it on, some kind of magic happened. A transformation. Her fringe needs a bit of a trim, and she needs an outfit and a story. But so far, I really like her a lot.